Donald doesn’t realise that the fishhook – much to Mickey’s amusement – is caught on his own tail. 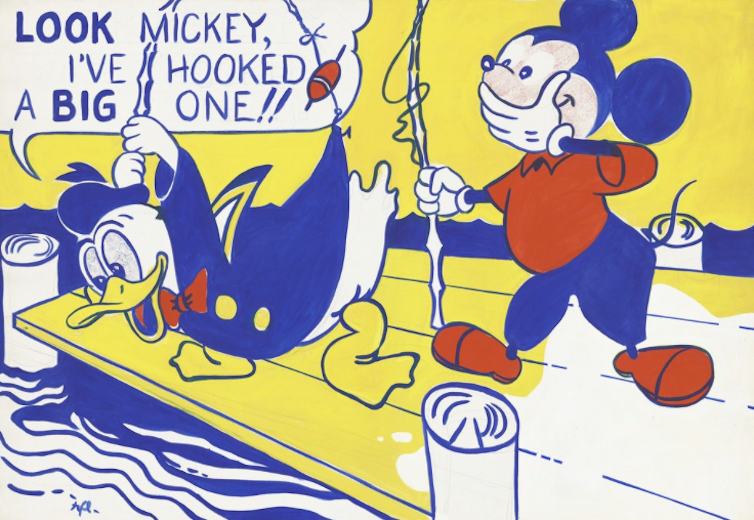 The image, entitled Look Mickey (1961), is bright, eye-catching and entertaining – but also playfully subversive. 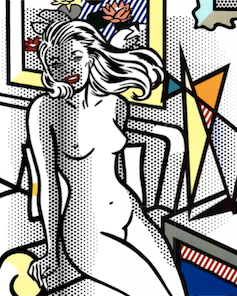 Lichtenstein’s decision to appropriate a scenario from a comic book marked a serious challenge to the Abstract Expressionism of artists like Jackson Pollock, which had dominated American art since World War II. Lichtenstein was in the vanguard of the Pop Art phenomenon, which was fascinated with industrial processes and mass consumerism. He built an entire artistic career on deceptively simple works that appropriated from comic books, advertisements and pulp fiction – isolating, cropping or enlarging selected elements to create striking compositions. September 29 marks the 20th anniversary of his death: so what is his legacy, and to what extent has it endured? 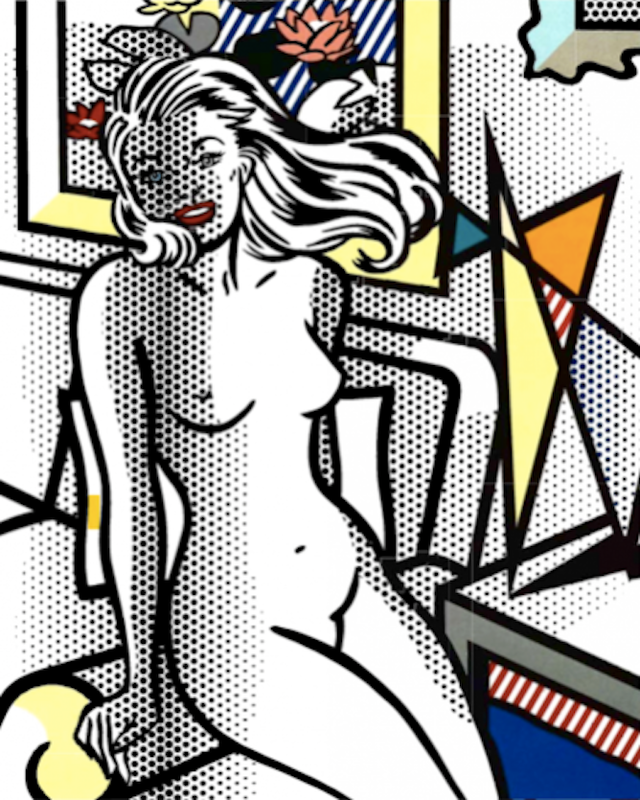 Lichtenstein was born in 1923 into a wealthy family in New York. After attending summer classes at the city’s Arts Students League, he studied at Ohio State University. This was disrupted by World War II, in which he served in the army in Europe. He then returned to university on the GI Bill, which funded ex-servicemen and women through education. 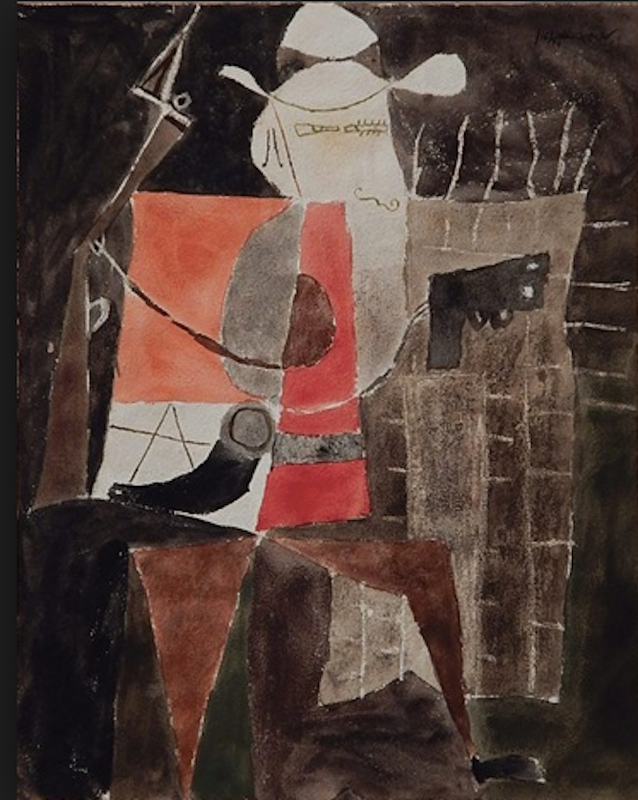 In 1960, back in New York, he began teaching at Rutgers University in New Jersey during a flowering of avant-garde activity at the institution. The campus became a site for performances, events and collaborations: a point of confluence between movements such as Fluxus and Happenings as well as early environmental art. Lichtenstein counted among teaching colleagues other important artists including Allan Kaprow, Geoff Hendricks and Robert Watts, while students at the school included Lucas Samaras. Lichtenstein’s previous works had experimented with Abstract Expressionism – opposite is General Custer from 1951. But now his paintings began to draw on the bold, arresting designs and narrative drama of comic books, featuring the iconic Ben-day dots that comic printers used for cheap colour shading. Lichtenstein’s work exemplifies Pop Art’s rich and complex relationship with consumer culture and social change during the febrile decade of the 1960s. His paintings are alive to contemporary obsessions with youth and beauty, the tyranny of consumer objects, and the intense emotional drama of advertising and the mass media. In Whaam! 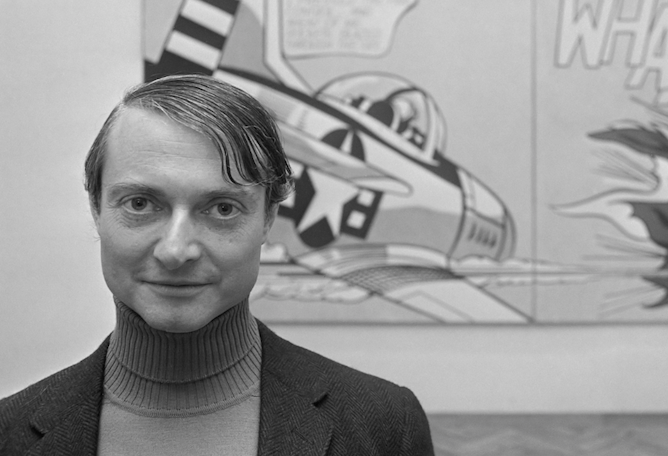 (1963), for example, Lichtenstein revealed the tensions and militarism of the post-war period and the Cold War. He used an image gleaned from the 1950s DC comic series All American Men of War to show one plane launching a missile at another, immolating the enemy craft in a ball of flame. The dynamism of the composition, together with the inclusion of the work’s onomatopoeic title above the fireball, both skewers and indulges the cultural connection between machismo and war. 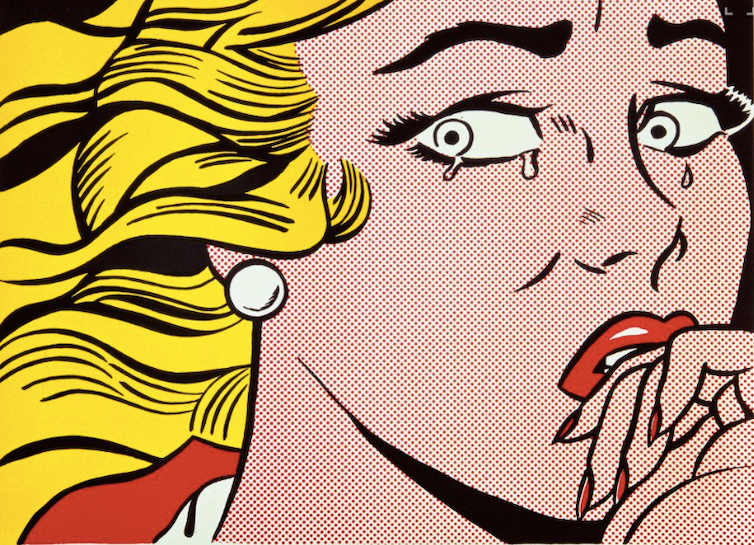 Machismo and misogyny are constant obsessions in Lichtenstein’s work – from early images of femme fatales and women abandoned by men, drowning in their own tears (Drowning Girl, 1963), to the saccharine nudes of his later canvases. The gender politics in his work remain open to lively, provocative debate: do these images critique the fetishisation of women, or are they guilty of replicating the gender stereotypes of their source material? Along with Andy Warhol, who also experimented with appropriating consumer packaging and design, Lichtenstein’s work helped to significantly grow the art market in the 1960s. Contemporary art began to fetch high prices on the back of a new network of dealers and collectors, culminating in its own hyper-commodification. And Lichtenstein remains in great demand today, of course – the title picture, Oh… Alright… sold for a record $43m (£32m) at auction in 2010. 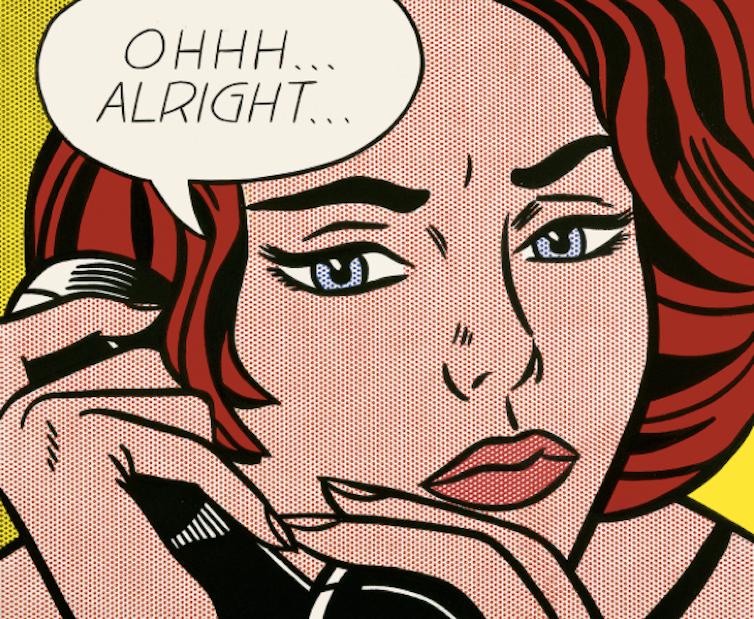 Lichtenstein’s enduring popularity was confirmed with a major retrospective in London, Paris and Chicago in 2012 – his first in more than two decades. Alongside all the comic-based paintings, it demonstrated his wider experimentation in materials. The show included sculptures, prints, collages and even a wall hanging, testifying to a degree of restlessness that gives the lie to any idea that Lichtenstein stuck to a formula. 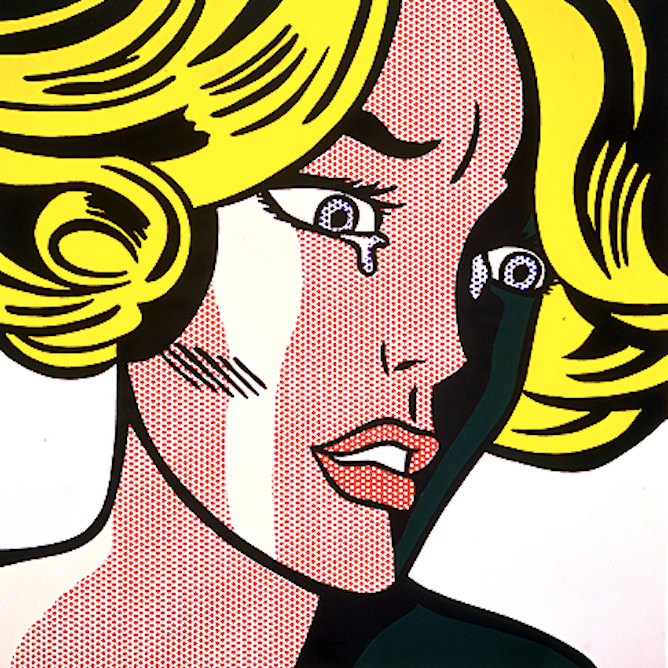 Having said that, Lichtenstein is perhaps most remembered for 1960s appropriation. He was by no means the first artist to use it in his work, but he did it with remarkable verve, invention and boldness. Other artists who have engaged with his oeuvre have employed similar techniques. The American practitioner Elaine Sturtevant even appropriated directly from Lichtenstein himself – her 1966 painting Frighten Girl (below) of Lichtenstein’s 1964 lithograph Frightened Girl (right) is part homage, part critique, as its slightly altered title wryly indicates. This ambiguity is arguably a key part of Lichtenstein’s legacy. While his work continues to delight and engage audiences, it also raises significant questions about gender, consumption and representation. 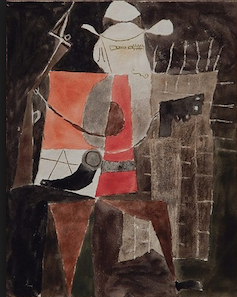 His paintings are part of an important story of 1960s art which continues to be re-told and re-visited in new and inventive ways by artists, art historians and curators.